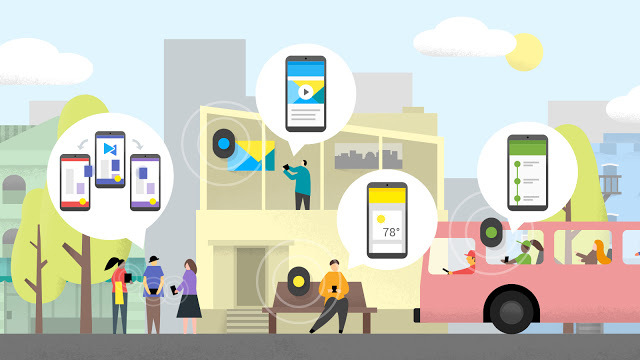 Contextual awareness is one of the pillars of Google's recent push in mobile communications. You don't have to look far to see that: Google Now has been getting better and better at "guessing" the information that you need before you even look for it. But when it comes to location, we all know that it can use some help. Not just Google Now, actually. Most current location techniques are quite lacking indoors, underground, or simply fail to differentiate between you standing in front of a bus on one side or the other of the street. That's where beacons, which are small Bluetooth Low Energy devices, come into play by providing a quicker and more granularly precise location information. But that's not all. Beacons can help transmit location-specific data to your phone, trigger a certain functionality in an app, or show relevant information. Beacons can communicate with your phone using several formats, like Apple's proprietary iBeacon, but the latter is limited to iOS devices only. Google's newly introduced Eddystone aims to be a cross-platform and open-source alternative to the current formats, and it's off to a good start. Eddystone, which Google has apparently named after a famous lighthouse in the UK, is already available on beacons from several manufacturers like BKON and Radius Networks. They can communicate with Android and iOS devices, as well as all platforms that support BLE beacons. They can also relay information beyond the iBeacon format, which is limited to a UUID (a unique identifier that apps can listen for and trigger certain actions upon). That flexibility allows them to transmit URLs (non app reliant), EIDs (ephemeral identifiers that change frequently and can only be read from authorized clients, say a luggage locator), and Telemetry data (for businesses to simplify their beacon fleet management). Google explains how developers and business owners can use Eddystone to implement a more robust beacon strategy in their apps or for their customers. Two new APIs are available to help with that: the Nearby API and the Proximity Beacon API. For more information, the Eddystone specification is hosted on GitHub, and you can read up on the developer side of things straight from Google.